The restaurant boldly states they serve the World’s Best Breakfast … and they deliver. This casual storefront establishment dishes up breakfast omelets that are meals in themselves, especially the ocean frittata containing delicately seasoned scallops, crabmeat, shrimp, broccoli, and mushrooms, and crowned with an artichoke-heart-and-creamy-Alfredo sauce. Seafood Benedict is one of the more decadent offerings. For the light(er) eater, a slew of creative sandwiches is served after 11am. Reasonably priced, cafe-style dinners are served during winter only. 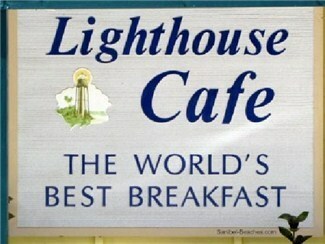 For the best pancakes ever, the Lighthouse Cafe has cornered the market, using a special recipe that draws up to 700 people a day in season. For just $5, go nuts on malted-blueberry or banana pancakes, or pretend to be healthy with granola-nut whole-wheat hot cakes with sliced bananas.